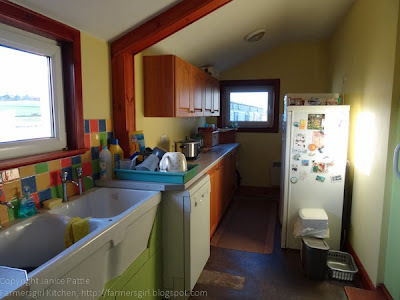 Farmersgirl Kitchen: Happy New Year - What's happening at Farmersgirl Kitchen in 2014? 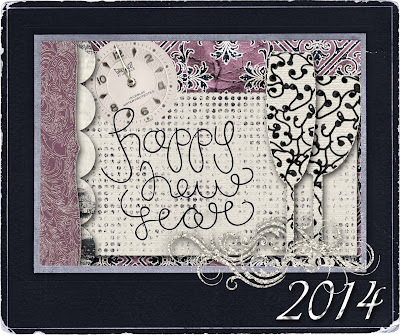 Happy New Year - What's happening at Farmersgirl Kitchen in 2014? I wish all of you a very Happy New Year and hope that this year brings you everything that you wish for and more. Here at Farmersgirl Kitchen, things are going to be a little different, particularly during February and March. Back in October we discovered that we have dry rot in our house, it's in the walls at the front of the house, mainly in the kitchen and the room above which is our bedroom. We are hoping that it will be confined to this area, but the treatment must go 1 metre either side of the affected area, so there may be more disruption. We moved out of our bedroom into the spare room back in October but our builder was not able to start the work until the end of January. This is giving us time over Christmas and New Year to pack away as much as we can from two bedrooms and the kitchen, as once I am back at work I won't have much time. We have a lot of stuff, we've been here since 1985 so you can imagine how much we have accumulated. Some of the boxes will go into storage and the kitchen units will go into another room in the house. This is my lovely kitchen which will have to be removed and reinstated later. It's only been in place for 3 years but fortunately the joiner who fitted it will be taking it out and he will take good care of it. 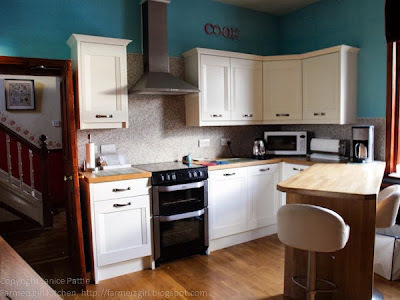 I am extremely fortunate that we have a 'back kitchen' or utility room where the fridge, freezer, dishwasher, washing machine, tumble drier and double belfast sink is located. I know it is bigger than many people's main kitchen. It also has plenty of cupboards but there will be no cooker (stove), just the microwave, my new Slow Cooker and a single electric ring which I bought so I can saute, fry and boil. The kitchen will be sealed off as the ceiling has to be taken down, we will have to go out the front door and in the back door to get to the back kitchen. As you can imagine, cooking is going to be challenging, I hope to share my trials and tribulations with you and I will try to find a way to continue to create tasty and wholesome meals with my limited cooking applicances! If I can I will share what I make with you as usual, but I hope you will bear with me if there are fewer posts and the variety of makes and bakes are much more limited. Best wishes for 2014, hope it all goes well and look forward to reading about your adventures in the temporary kitchen! Aw, poor you, Janice! I am sure you will make the best of it. It sounds like you have a good set-up with your back kitchen. And that slow cooker will be a huge help - I love mine. 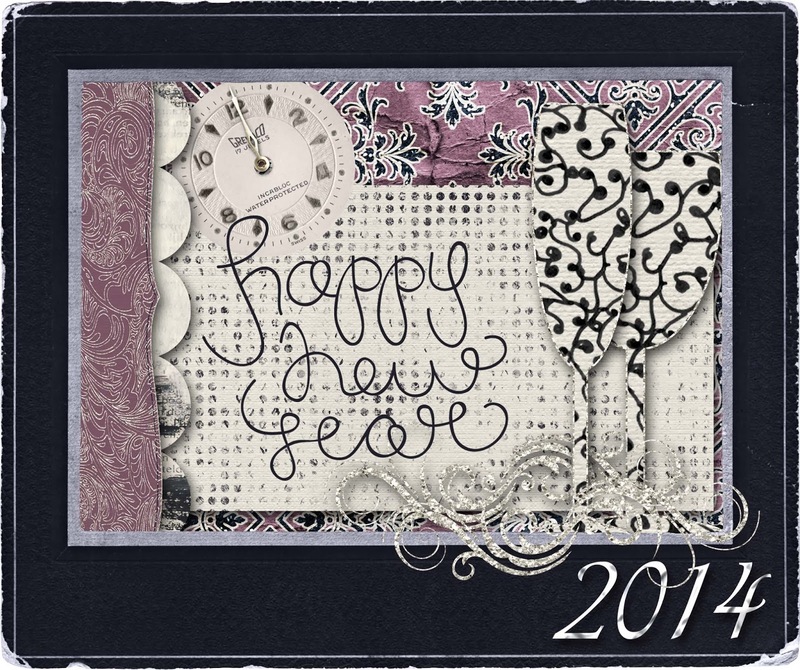 Wishing you and your family a wonderful 2014. That sounds horrendous! It may not be much consolation to you but your writing about cooking with one ring, a microwave and a slow cooker will be interesting for us! Hope it gets sorted for you quickly! and I am sure your ingenuity and creativity will see you though. ps you'll have to get experimental. There could be some great blogging in that! Thanks to all of you for your lovely comments. I've been putting it out of my mind until Christmas was over. Just want to get on and get it done but another month to wait, in the meantime I'm packing my life away. oh gosh, what a nightmare! I hope it gets sorted as quickly as it can. You have such a beautiful kitchen! I would love to have a kitchen like that - look at your daylight! So it's going to be a microwave oven, slow cooker and electric ring? Oh dear, poor you. It's a shame to have to take out your beautiful kitchen. I would be in tears! Dry rot is nasty. I feel for you having so much disruption but it's one of those things where you just have to grit your teeth and get on with it. Let's hope the treatment all goes smoothly and you are up and running normally soon. Cooking with limited appliances can be fun, a bit like camping! I wonder if at the end of it you will wonder why on earth you need so much stuff! So sorry to hear about your bad luck with the rot. I was stuck without a kitchen for quite a while some years ago. I tried to be resourceful, but I confess that I got to know the local restaurants pretty well at the time. Janice, your kitchen is so beautiful! Builders start at our place next week so I know exactly what you're going through. At least you have a spare kitchen! We are planning to barbecue a lot, so I hope the weather perks up a bit. Look forward to seeing your results! Aw thanks, I do love my kitchen and it will be going back in the same as it is now. Good luck with your kitchen too, Lucy. Oh no Janice, how did I miss this bit of news. It sounds like a horrid situation. You have such a pragmatic attitude though, I'm sure you'll manage well. I hope things get sorted out for you soon. Thanks goodness for your utility space.